Hello Duelists! Maximizing the value of the cards in our deck is one of the keys to winning, but how exactly do we maximize the value of our cards? This week I'll be discussing how to maximize the value of one of the most played cards this format: Mind Crush. Mind Crush is one of the strongest trap cards available in the current meta as it has at least some application against every commonly used deck (Nekroz, Burning Abyss, Shaddoll, Ritual Beast, Satellarknight, Qliphort, etc). Depending on which deck you’re using, there will be different times that you want to activate Mind Crush when playing against Nekroz.. Keep in mind these aren't strict rules to follow, but guidelines. As a general rule I wouldn't activate Mind Crush on a ritual spell if my opponent has no monsters on their side of the field and has a decent amount of cards in hand, because even if I call correctly with Mind Crush their Ritual spell just replaces itself and they may be able to continue their turn. If they summoned something like a Manju then I would use Mind Crush since their Ritual spell probably won't be replacing itself this turn. If my opponent doesn't have any monsters on the field and has a decent amount of cards in hand then I would hold Mind Crush until they try to use their second Ritual spell. 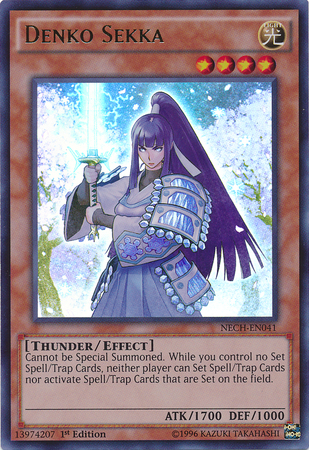 If you're using a backrow heavy deck such as Satellarknight, you should keep in mind that you can always call a card that you would outright lose to (such as Denko Sekka). For example, let's say you opened Deneb set 4, and one of your sets is a Mind Crush and possibly a Reinforcement of the Army / Call of the Haunted. I don't believe that blindly using Mind Crush would be incorrect, as in this scenario you outright lose to Denko Sekka. Even if they don't have Denko Sekka and you're forced to discard a card, not only will you know their whole hand but the monster in your hand you got for free off Deneb anyway and you can keep looping your Denebs if you have ROTA or Call of the Haunted. Looking at your opponents facial reactions can help decide whether using Mind Crush blindly is worth it. If they seem unusually calm, it might be because they're trying to act casual to not tip you off about anything, or maybe they're unusually talkative all of a sudden. Facial reactions can help decide the game, but be careful coming to a conclusion because your opponent may just be really good at bluffing. If you're using a deck that isn't really hurt by Unicore’s effect or you have an effect negation trap card such as Fiendish Chain then I wouldn't use Mind Crush to call Unicore when they activate Kaleidoscope, because hitting the second ritual spell is more crucial. 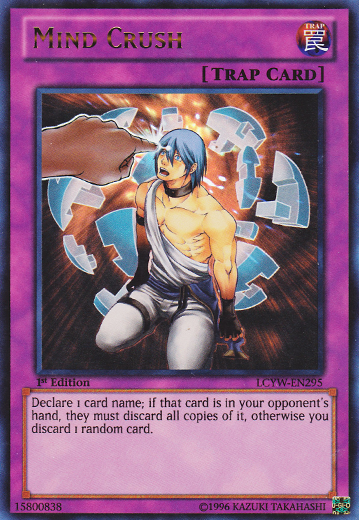 Since you're not using Nekroz your opponent will probably try to Trish you if given the opportunity, and if you allow Kaleidoscope to go through they now have a monster on their side of the field so their Ritual spell won't replace itself this turn and now when your opponent activates Nekroz Cycle and you use Mind Crush calling Shurit, their whole plan is ruined because they lose the Shurit search and they probably can't revive the monster they wanted to or do much for the rest of the turn. There is something that some Nekroz players have begun doing to play around Mind Crush: when they have Nekroz Cycle and Shurit, they set Shurit and then activate Cycle so that you can't Mind Crush their Shurit. The one big flaw to this is if you search a Shurit and set a monster your opponent will know that you're trying to play around Mind Crush and will just call Nekroz Cycle which will probably set you very far behind. "Why don't I just set Cycle then set Shurit?" Since you're using Nekroz odds are you didn't get to both Cycle and Shurit without your opponent knowing that you have at least one, you probably searched out at least one of those 2 cards. Let's say your opponent knows that you have a Shurit because you special summoned Unicore and Herald of Arc Light just searched Nekroz of Brionac which searched Shurit, if you set a backrow your opponent will think it very awkward for you to search Shurit and not do anything with it, so it would be logical to immediately call Shurit with Mind Crush. Let's flip that scenario around and say that you searched Cycle, the same logic is applied here: why search Cycle and not do anything with it. So if you set a card, it still makes sense for your opponent to call Shurit with Mind Crush (not to mention if your opponent has Mystical Space Typhoon that can also ruin your play). If you're using a backrow heavy deck or you just happened to open a couple Spell/Trap cards there is an easy way to make sure that your opponent doesn't get maximum value from their Mind Crush. This is a pretty common trick but I still feel I should mention it for those who don't know because it's a pretty important thing to know. Let's say your hand is Reinforcement of the Army, 4 trap cards, and a monster. You should set your 4 trap cards and then activate Reinforcement of the Army. This way, when your opponent Mind Crushes whatever you added, he won't know your backrow cards, which greatly benefits you. Since no one is using Malevolent Catastrophe you don't get punished for doing this either. If you're using Satellarknight there's another trick I like to use. Let's say your hand is Reinforcement of the Army, 4 backrow and you've already used a Spell card such as Mystical Space Typhoon, Dark Hole, Raigeki, Book of Moon or something of the sort. I would set three backrow (not 4) then activate Reinforcement of the Army and add Deneb, this way I have two cards in my hand and my opponent may assume that the other card in my hand isn't a backrow but rather a monster such as Satellarknight Altair, and may not use his Mind Crush on Deneb because if my in hand card is Altair he didn't get any value out of Mind Crush. Then after I search with Deneb I would set my last backrow. That's all for this week's article! Special thanks go out to Hrair Oganesyan for giving me this week's article topic. If you'd like to see me write about a certain topic feel free to message me on Facebook. The Circuit Series stops by St.Louis, Missouri next on June 6-7! And As Always Play Hard or Go Home!